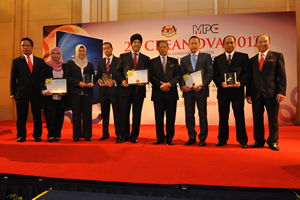 KUALA LUMPUR, 15 May 2012 – The National University of Malaysia (UKM) has been awarded a ground-breaking programme to undertake the biggest ever survey of innovation preparedness among local companies. The Malaysian Productivity Corporation (MPC) picked UKM from five local universities in bids for the survey dubbed MyTIC to create an index on innovation preparedness of local firms to enable the authorities to gauge their competitive edge. The study is expected to give the clearest picture yet about the state of innovation and competitiveness of local manufacturing and service sector firms in using their workforce. The study will be carried out by the Quality and Efficiency Calibration Unit of the Faculty of Science and Technology (FST) UKM. The companies to be surveyed, range from large to small ones and are at least 51% locally-owned. A Memorandum of Agreement (MoA) for the task was signed at a ceremony to launch the 2011/2012 Productivity Report, CreaNova 2012 or Create and Innovate. MPC also inked two other memoranda of understanding with Universiti Tun Abdul Razak and Monash University Sunway for other tasks in conjunction with the launch. International Trade and Industry Minister, Dato’ Sri Mustapa Mohamed, who officiated the launching of the second MPC productivity report, witnessed the signings. Head of Quality and Efficiency Calibration Unit of FST, Associate Prof Dr Nur Riza Mohd Suradi told UKM News Portal that the first MyTIC report is expected to be ready for submission to the MPC in September. She said several parameters, such as innovations in optimising workers will be examined. The unit may also look at whether companies can raise productivity in the rapidly-changing labour market. The survery is estimated to cost about RM500,000 and would involve the deployment of a team of survey-takers including face-to-face meetings with the companies representatives, said Dr Nur Riza. Dato’ Sri Mustapa told reporters at the function that Malaysia needed to reduce its dependence on foreign workers by about 20% by 2020 to be able to meet the target of becoming a developed nation. There are currently some 700,000 migrant workers, mostly in the manufacturing sector and any reduction would be done gradually. He also said that not all foreign workers could be replaced by Malaysians as there would be some critical sectors needing expatriates while not all locals were interested in certain jobs like those involving manual labour. He expressed regret that Malaysia was still lagging behind the developed nations because of its over-dependence on foreign labour. Dato’ Sri Mustapa said although the nation’s GDP growth of 4.6% is commendable for a developing nation, it may not be good enough to reach developed status by 2020. He praised the MPC for its efforts to raise productivity which brought in savings of almost RM1billion since the MPC was setup in 1993.